Too many times I have thrown one egg white, because I couldn’t make up my mind what to do with it. Now I usually save them in a container in the deepfreezer keeping track off them with tally marks for that day when I am in the mood to make meringue. It recently dawned on me that tuiles are a perfect way to use up a single leftover egg white and create some sophisticated wafers to be enjoyed with coffee or as a decoration for ice cream. 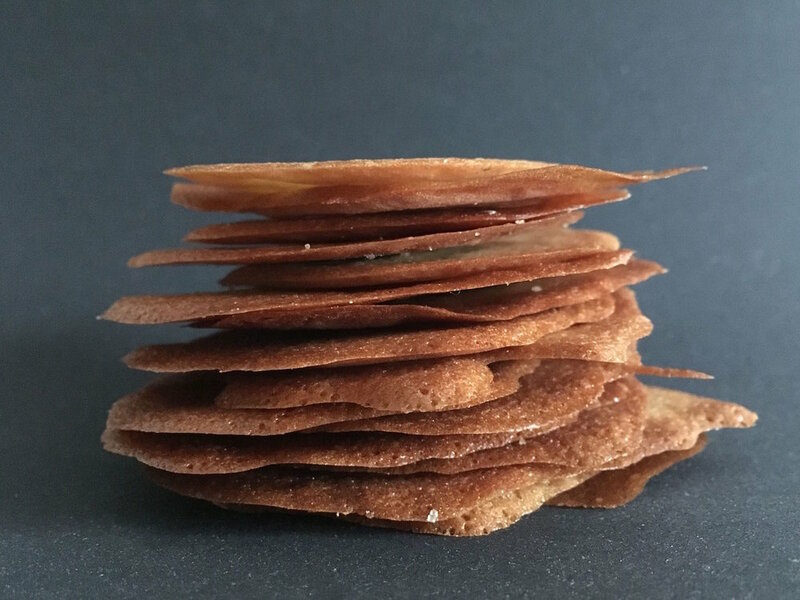 If you have never encountered tuiles: they are French biscuits, superthin and crispy and you can add additional flavour by using spices and herbs. It will make them look prettier, too. You can create interesting shapes by making a stencil from the lid of a plastic container (for example a large tub of yoghurt), I use an offset spatula or the bottom of some measuring cups to distribute the batter. I also like to stack two baking sheets on top of another to make sure they don’t burn. They are superthin and delicate wafers so you need to keep an eye on them. You will also need several rounds of baking since you cannot accomodate all of the batter on one sheet. Here I have adapted the recipe of Alice Medrich in her wonderful book Chewy Goey Crispy Crunchy. Preheat the oven to 150°C (300°F). In a bowl whisk together the ingredients until well blended and you have a smooth batter. Let the batter rest for at least 10 minutes or in the fridge overnight. Use two baking sheets stacked on top of another, line with kitchen paper and drop level teaspoons spaced 5 cm (2 inches) apart. Spread them with an offset spatula or the bottom of a small measuring cup to 5-6 cm (2-2 ½ inches) about 1-2 mm thick (1/16 inches). Alternatively use your stencil. Bake for 12-15 minutes, rotating the sheets after about 10 minutes to ensure even baking. Check on them towards the end. They should be a nice golden colour. They will have a pale centre and about half to three quarters of the edges should be golden brown. Transfer the tuiles on the kitchen paper by pulling the paper and leaving them to rest on a flat surface or cooling rack. They will be completely crisp when cool. If the cookies are not baked long enough they will stay soft.